I was contacted by Prof. Kyle Ormsby in the Math Department a while back about a project he was working on with his new 3D printer, a recent-generation Makerbot. The idea was to create a few “bodies of constant width”. A sphere is the simplest body of constant width but it turns out there are others as well. Here’s the requisite link to the Wikipedia paragraph on Meissner Bodies. There are lots of cool things about these objects and this video really sums a lot of it up. The cool thing is that they can act like ball bearings even though they’re not round. Kyle wanted to make a few of these objects on his printer but it turns out that drawing them up into a 3D model is relatively complex. I’ve been using Solidworks whenever I have the chance to help visualize projects or assemblies and it turns out that it’s great for this application as well. Unfortunately I haven’t had the time (and I’m not sure I’m even capable given my level of Solidworks competency) to draw them up but the internet giveth in the form of GrabCAD, a site that hosts lots and lots of free CAD models the people have drawn up and posted. As you can imagine, someone had drawn up some surfaces of constant width and posted them. 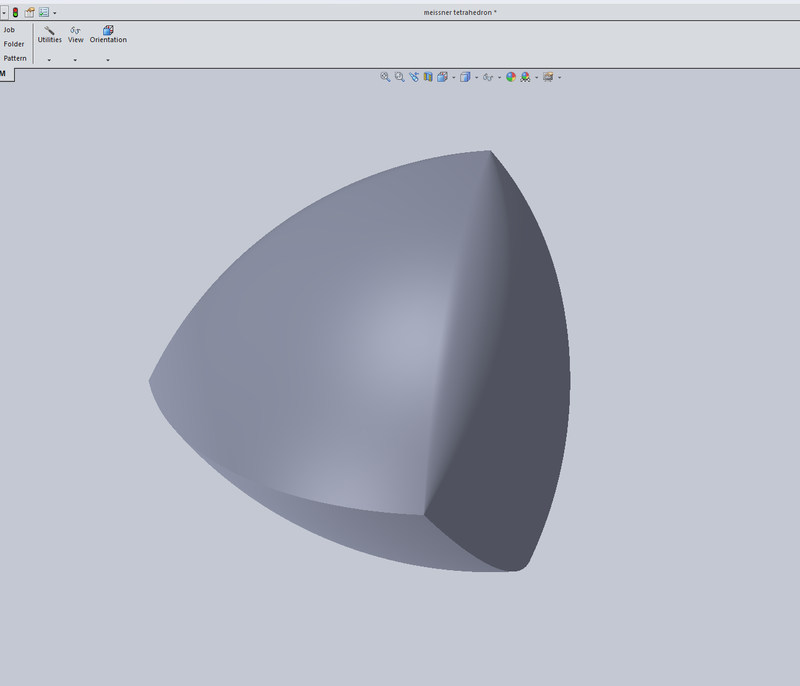 Meissner Tetrahedron from SW file drawn by GrabCAD user that I opened up using Reed’s Solidworks License.